I interrupt this travel and adventure blog to talk about a major news event. Many (most?) of my readers don't know I worked for The Washington Post for eight years. That probably explains why I use apostrophes correctly (usually) and foolishly cling to legacy semicolons. Few other than poor Chip, who has to hear my screeds, know how much I fret about the future of the news business, since we collectively decided we should get news for free. In 1996, I started working in the digital newsroom of the Washington Post in Arlington, Virginia, then separated from the newspaper newsroom by a river and a gulf too ponderous to cross. My first day on the job, the airplane carrying Secretary of Commerce Ron Brown crashed in Croatia. We all stood watching coverage on CNN, not nose down tapping on computers, because the Washington Post was not on the worldwide web yet. That came two months later in June 1996. In July 1996, TWA Flight 800 went down at 8:21 p.m., and I pulled my first all-nighter. Our little band of step kids south of the river was learning about the insatiable nature of a 24-hour news monster. We invented and reinvented ourselves and online news coverage on a worldwide stage, although ironically outside the glare of the Post newsroom, because in 1996 the Post newsroom didn't have internet. Back then, the Post's distribution -- and therefore audience -- was strictly local. You couldn't buy the Post very far outside the D.C. area (this is still true today). Overnight, the website took the Post global. Inexplicably, many at the Post didn't grasp the significance of that. For years. But there was at least one who did, and his name was Don Graham. He crossed the abyss between the newsrooms to talk to us, to encourage us and most significantly to underwrite our paychecks. All those years, before the tables turned, when the website was a financial drag on a then profitable paper, he grasped what he was investing in. The Grahams were remarkable stewards of a critical institution, the third leg of our democracy. Their paper held our government accountable, challenged our politicians and understood the critical nature of investigative journalism that turns on a very slow wheel but without which the press cannot serve its Constitutional purpose. I considered it an honor to work for the Washington Post, and I am grateful for how it has molded my view of the world and journalism's place in it -- and for the amazing, intelligent and witty people they hired, who are now my friends. I have been an unforgiving critic of a faltering Post the past few years, but I have retained my respect for the Grahams. 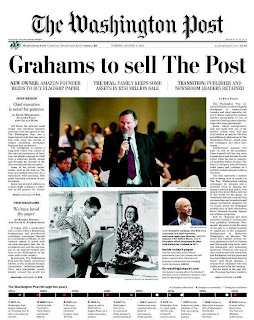 All the years I worked there, I felt confident knowing a Graham was watching over us, because the Grahams understood something that new media often doesn't: journalistic ethics. The sale of the Post is rattling news. Stories about it are full of 'end of an era' sentiments, but the truth is, the era ended in 1996, and it has taken this long, 17 years and two months, for this reality to fully surface for the Post. Bezos said yesterday, in a letter to Post employees, that he understands journalism's role in a free society and is taking lessons from the Grahams about getting it right and about following the story no matter the cost -- and arguably he mitigates that budget problem for a while. I hope that Bezos, with his burgeoning toolbox of technology and his unfettered vision of the future, will make washingtonpost.com relevant again. I hope he will rehire those the Post sloughed off as if they weren't the very core of potential relevance. I hope his presence won't stifle relentless coverage of big business and its friends in office. I most earnestly hope that this man with none of the crippling legacy issues of print will carry the irrefutable journalistic legacy of the Grahams into this not-new era and make the Post formidable again. THIS IS NOT A GAME, Y'ALL! Well said. Thanks for sharing your thoughts. Let's hope Bezos means what he says. Thanks, Sabrina. I have added you to our Blog Log! Thanks for writing this, Tammy. The past few days have been oddly emotional. I've been surprised by how emotional this news has been. My separation from the Post by time and water doesn't seem to have softened the blow. At least, unlike you, I did not have to sound cogent in interviews with the Post and CBS while the rest of the journalism world could only eke out one word expletives. See you soon!